A plant with a bit of a split personality, Daviesia horrida has very attractive bright orange flowers, brilliant in the garden. On the other hand it also possesses some very sharp thorns. hence the common name, Prickly Bitter Pea. This is a species that is not widely grown as a garden plant, however it does offer brilliant colour when in flower. You could also use it as a barrier plant, the thorns will deter most animals as well as people. This a plant that varies in height, reaching from around .5 metre to 2 metres in height. 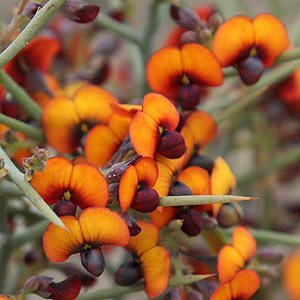 Daviesia horrida is originally from western Australia and grows in full sun in very well drained soil. Found in the southern areas of Western Australia, around Albany and Perth with other scattered populations, flowering period is from winter through to spring. In its natural habitat this is a fairly straggly or sparse plant, however with some careful tip pruning it can be maintained with a bushier habit. The flowers are a golden orange with a deep crimson red pea. Use as a feature plant for the flowers or as a impenetrable low hedge. Will reach a height of between 1 and 2 metres. Rarely seen in cultivation, however some excellent examples can be found in the botanical gardens in Cranbourne, Melbourne.